Steaming is a tasty way to cook vegetables and as with any technique there are considerations to be made. Since there is such a wide variety of vegetables you will find as many ways to steam them. In general steaming is a quick way to prepare vegetables. Steaming also retains a lot of vitamins, more so than boiling. Below are some guidelines to follow. Always wash vegetables before steaming. Have available a steaming rack, basket or bamboo steamer. Begin cutting the vegetables after getting the water on to boil. Use the highest setting to bring water to a heavy boil. Vegetables will cook faster and absorb less water. Cut your vegetables approximately the same size so they cook evenly. Denser vegetables can be cut smaller. Cover the pot you are steaming in to capture the steam and keep a high temperature within the pot. Most vegetables will cook in about 2 minutes. Thicker vegetables may take3 or more minutes. Whole potatoes may take up to 30 minutes to cook through. Serve when done. If steamed vegetabled sit they may become wrinkly or soggy or both. Steaming vegetables is only half the fun. Topping them brings infinte possibilities to your table. Most vegetables can be prepared as simply as sprinkling salt and pepper. Maybe some butter or olive oil? Cheese is usually welcome. Try Knox's traditional Cracked Pepper dry rub sprinkled on steamed potatoes. Our Jamaican Jerk dry rub on steamed green beans is a great way to jazz up your beans. 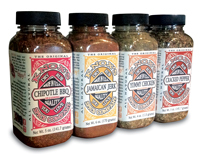 Try our Chipotle BBQ dry rub on steamed corn. It will keep them coming back for more.